It has been 18 months since thousands of people came out into squares in 900 cities across the world under the banner of Occupy. 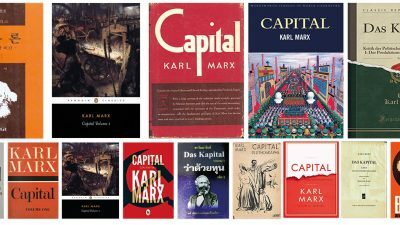 As this was the last big mobilisation against austerity and capitalism in this country, Tim Gee has taken a perfect moment to publish writing from the time and since. Even though there has been a recent resurgence in street activity, from the University of Sussex and bedroom tax protests to the street Thatcher parties, Occupy was able to bring masses of people, who don’t normally interact, together for months on end. The anger and hope that filled the squares along with people is captured in the opening chapter of ‘You Can’t Evict an Idea’. Gee details the energy people had to discuss the failings of the current system, and how we can do things differently together, through large consensus meetings (that people actually enjoyed and wanted to be apart of!) Being able to read over what Occupy was is truly inspiring and is important to remind us what we were capable of. 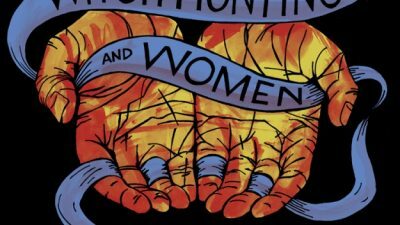 Gee also puts the Occupy movement in an interesting historical context – not just in relation to the dramatic events of 2011 (Tahrir Square, Indignados and more) but also to our own penchant for occupations as a tool for political change. He reminds us that whether it is military bases in Greenham Common, the G8 summit in Gleneagles or the eviction of travellers on Dale Farm, camping has allowed us to come together and form an alternative society, as well as taking direct action against the institutions oppressing us and others. However, from this historical context comes an attempt to place Occupy as just another step in the ‘global movement’ – specifically, this is framed as Occupy almost being Climate Camp continued. Climate Camp had some achievements but cannot be dressed up as anything but acting within an activist ghetto. Occupy in contrast was an explosion of emotion that incorporated people of all ages and social class with few links to previous campaigns in the UK. Clutching at straws for Occupy’s achievements, Gee twice asserts a link between Occupy and Boycott Workfare. Being involved in both of those groups, this attempt to once again impose some continuity is untrue. Occupy has, however, had real and solid achievements at Friern Barnet library and through homeless Occupiers fighting for housing and social space in London through squatting. Could this confusion about what was happening on the ground in Occupy be because Gee is a writer rather than someone embedded within in the movement? But this position does enable him to give an interesting overview of both the UK and American events, capturing the diversity of the Occupy camps and actions on both sides of the Atlantic. 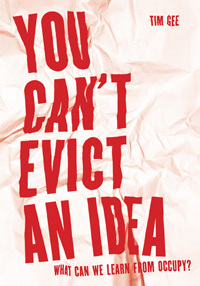 ‘You Can’t Evict an Idea’ allows us to revisit and reflect on what was a wide and inspiring movement, that will no doubt continue to influence people and inspire actions beyond the call of ‘Occupy’. You can download the ebook for free, or order a print copy, here from Housmans bookshop.